You know you want a grilled cheese donut .... so I am giving some away! One of my favorite shows to watch is Shark Tank. I cannot begin to tell you the thrill I feel when I see a clever problem-solving idea or a unique gift that I can give to someone I love. Since most of you know I love food discoveries more than anything else in this world -- this is the best part of watching the show. I have been known to be a sucker for unique culinary concoctions. I first learned about TOM+CHEE through Shark Tank. I thought the idea of a grilled cheese donut was brilliant! That salty and sweet goodness in every bite sounded PERFECT. When I moved to Omaha back in the fall, I learned that there were plans to open up a TOM+CHEE franchise in the city. Greats new for this adventurous food-loving kid! 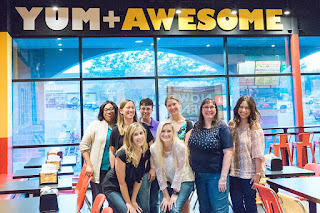 I had the pleasure of going to a 'taste party' in the company of several lovely Omaha food bloggers at TOM+CHEE recently. While the iconic grilled cheese donut will always have a special place in my heart, it was wonderful to discover all the other yummy stuff TOM+CHEE had to offer. Let's talk about my favorite fancy grilled cheese sandwiches on the menu. Now let's talk grilled cheese donuts. TOM+CHEE is famous for these and if you are on the fence right now -- c'mon, just go ahead and try one. Live a little, play a little, and you won't regret taking that adventurous step! Surprise addition to the menu: Healthy Salads! I would never think of ordering salads in a grilled cheese donut shop but I was really impressed when I tried these. Really solid choices as sides to the sandwiches. Something to be truly considered. I work with children full-time and I always say "Sharing is caring." So -- it would be cruel to share all these mouth-watering photos and not give away some, right? So I am giving away two (2) sets of vouchers worth $25 each. One way to win these vouchers is to leave a comment on this blog post. All comments will be drawn in a raffle and I will pick a winner on August 8th at noon. Another way to win is to head over to my Instagram Account (@happysammy25), "Like" it or "Comment" on it. All likes and comments will be drawn in a raffle and I will pick a winner on August 8th at noon. And it doesn't stop here. These vouchers are being given away on these other blogs and you are invited to participate as well! TOM+CHEE is located in 14513 W Maple Rd, Omaha, NE 68116. Hours are 10am - 9pm. Update: The voucher goes to Ms. Candi! I am so glad you had a great time! Your pictures are amazing!!! I love Tom + Chee so I hope I win a voucher. I am so glad you had an awesome time at this event! The pictures are amazing! I love Tom + Chee so I hope I win a voucher to share with someone. Thanks for a great giveaway! Excited that Tom+Chee is in Omaha! The food looks fabulous! I want to try the grilled Mac and cheese or any donut grilled cheese! The strawberry lemonade donut looks so good (definitely not diet approved but yummy)! I would love to try the Caprese salad. Looks delicious! Thank you for all the comments! Having fun connecting with all of you. The BBQ & Bacon chee sounds AMAZING! I would love the Bacon + Blue! Thanks for the giveaway. I would love to try the Grilled Mac N Cheese sandwich, paired with some fancy tomato soup! Perfect! I am dying to try a grilled cheese donut! They look really good. Thank you Omaha friends. You rock!